On the left hand side select the employees for whom you wish to export payslips. Several options for selecting which payslips to export are available by clicking the ‘Select By’ button. 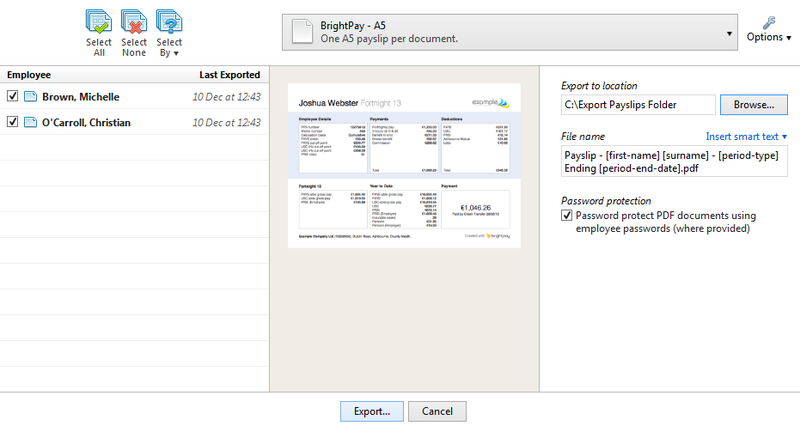 Should you wish to further customise your payslips before exporting, click the ‘Options’ button. This facility allows you to add or remove certain information on the payslip, for example add employee address or remove the payment method details. Select a location where you would like to export your payslips to, and enter a file name. If you would like to password protect the payslips, simply tick the box provided. Employee passwords must be entered beforehand within their HR section in order for the payslip to be password protected on opening. When ready, click ‘Export’. A confirmation message will appear when the export has completed.